The Week in iPhone 4 Cases: I've got the power! Our latest roundup of iPhone 4 cases features pastel colors, better battery options, and European styling. Read on for the new protection products we've seen this week. Bodyguardz is offering its new $30 Shelter cases in two colors: "mint" and "blueberry twist." The company says the cases are made of bulletproof materials—just in case you end up in a firefight with your iPhone as your only protection—including a rubber mold said to enhance the sound quality of the phone's speaker. Each Shelter come with a screen protector and a cleaning cloth. Caze: This company believes that polka dots are back in style. In fact, Caze predicts they'll be a "hot trend" for the summer of 2011, as evidenced by the new $27 Duetto, a bumper-style case that includes two interchangeable back plates printed in polka dots, zebra stripes, or leopard spots. iKit: Accessory maker iKit has unveiled its $65 NuCharge Case, a two-ounce battery pack that doubles the battery life of the iPhone and includes an integrated kickstand for video viewing. Compatible with both the AT&T and Verizon versions of the iPhone 4, the case features a rubber finish to guard against drops and for a better grip. The company includes a Micro-USB cable with each NuCharge. Incipio: Incipio has introduced the $70 OffGRID Backup Battery Case, a slender, hard-shell case with a built-in battery and four LED lights that display the battery's remaining charge. The case, comes in four colors, slides onto your iPhone 4, and comes with a Micro-USB cable for charging its battery and for charging and syncing the phone. IvySkin: This New Jersey company is now selling the $50 Wrangler Case, an aluminum-and-polycarbonate model, available in a half-dozen colors, that includes an anti-glare front glass guard. Joy Factory: The new $50 RainBallet is a waterproof case that, according to its promotional video, can help your phone survive a dunk in the pool—though you probably don't want to test that too often, as the case is designed for exercise and rainy conditions, not underwater use. The company says that despite the full-body seal, the case maintains sound quality during phone conversations. The RainBallet also includes transparent lenses that permit iPhone photo taking and video recording. 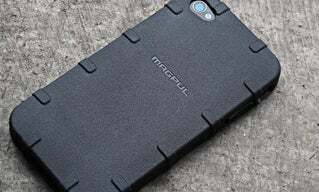 Magpul Industries: If you're looking for a case on the bargain end of the price spectrum, Magpul's new line of $10 Field Cases might deserve your attention. The company is mostly known for making rifle accessories, and the new cases are pitched at folks who tote their iPhone into the "field." Each snap-on case is made of rubber with ribbed grips along the side and is available in six colors—but if you're taking it hunting, you might want to order the orange. PhoneSuit: Phonesuit has debuted its new $80 Elite Battery Case for iPhone 4, a power-providing case that can recharge an iPhone 4 in under two hours—PhoneSuit claims its lithium-ion-polymer battery is more efficient than competitors'—while adding minimal thickness (approximately two-thirds of an inch) to your phone's profile. The Elite includes a Micro-USB cable for syncing and charging your phone and is currently available in black, though PhoneSuit plans to eventually offer up to eight colors. RokForm: This precision-case vendor has unveiled its line of $80 Rokbed aluminum cases for the iPhone 4. The frame—designed for the AT&T iPhone—weighs less than an ounce, and RokForm says the metal case does not touch any portion of the phone's antenna. The Rokbed is available in three color styles. Seido's: The $30 Active X case is a two-layer affair, featuring a silicone interior to absorb shock and an "arachnid" exterior design to prevent scratches. The case adds just 2.2 millimeters to the thickness of the iPhone 4. It is not compatible with the Verizon version of the iPhone.